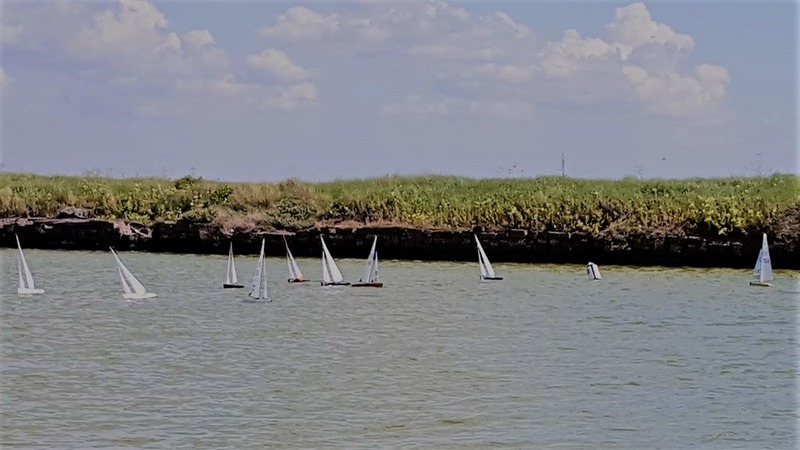 18 skippers turned out for the inaugural running of this championship, hosted by the Southend club at the Coalhouse Fort lake. The early morning rain cleared before the start to leave a clear sky, although the variable strength WSW wind forced a slightly compromised course of 3 beats & 2 runs to be set. Despite the wind swinging more westerly at times, the course remained unchanged throughout the day. Following the briefing, the fleet was divided into 2 heats and the racing continued at good pace all morning. The competition was close, with tricky wind shifts causing moments of joy and despair as some tacked into a massive hole while others rode a huge lift to the windward mark. The last few meters often proved cruellest of all with several places being lost or gained right at the line. 5 races were completed before the lunch break at 1 PM, all won by the ever consistent Buzz Coleman. Racing resumed at 1.30 with the wind now around 12 MPH and the occasional gust of up to 20MPH, fortunately, the sun warmed us enough to get striped off to tee shirts. The afternoon provided more close racing as a few of the early contenders faded whilst others found their stride. This closed the points table up considerably over the last 4 races, before looming black clouds suggested a prudent end to the days racing at 3.45. It was encouraging seeing several new skippers entering their first open event & even more so to watch their performance improve as their confidence grew throughout the day. All our first timers said they had an enjoyable day, some even won prizes, with many commenting on the friendly atmosphere that the 65’s events always seem to produce. I think we even persuaded some to enter the nationals later in the year which cannot be a bad thing. Buzz Coleman proved the class of the field, winning all but one of the races, but did give us mere mortals some hope by forgetting to switch his boat on before launching in one race. Dennis Graham took advantage of Buzz’s mistake to win that race & with it secured 2nd place overall by 1 point. Mark Hainsworth’s third place was well deserved for his consistency in his first open event, together with another first timer, Pete Mann, 3 points further back in 4th place, it looks like the Eastern District has some up & coming new talent in this class. 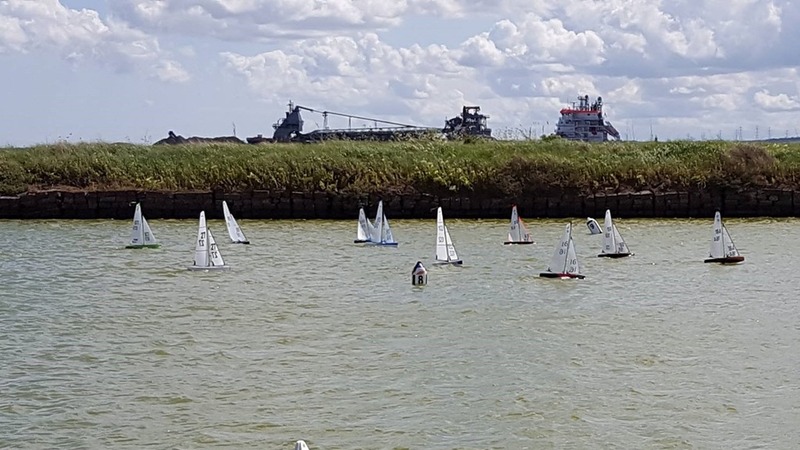 This was the Southend club’s first ever endeavour at running an open sailing event & we are indebted to the Coalhouse Fort club for the use of their water, along with the enormous amount of help and advice given, without which this event would not have been possible. Above all we would like to thank all the competitors for sailing in such good spirits and making the event so enjoyable. On behalf of the Eastern District Committee, we would like to thank Southend MBC for managing their first open event. They are to be congratulated on the way they coped with the the build up and the event itself and this should encourage other clubs to consider running open similar events. For anybody who lives in the Bury St. Edmunds area, a number of Alton Water Radio Sailing Club members will be sailing at Lackford Lake this Saturday. This is a smaller lake in Bury St Edmunds and there is an active dinghy club there. They are interested in seeing the DF 65 and hearing about how they work. This means two things… Anyone who is interested, they will start sailing there at about 14:00 and then be giving a presentation at about 18:00 to their members. It is likely that there will be less people at Alton this weekend… But don’t forget Wednesday evening sailing we have had a couple of sails on Wednesday evening. We start at 6 and it has been fun, if not cooler of late. Of course anyone who wants to sail on Saturday is still welcome. This event is open to all MYA members with a registered Dragon Force 65 boat. Competitors are requested to use the MYA Online Entry Form if possible, but if not email Glenn Meekcoms (glennsprays@hotmail.com) AND John Newton (john-newton@tiscali.co.uk). Please include all details such as; Name, Sail No., MYA No. and Emergency Contact Name and Number. There will be a skippers briefing at 09:45 am with the first race shortly after at 10:00 am. No race will start after 4:00 pm and any race in progress at 4:30 pm will be abandoned. The MYA Standard Sailing Instructions (SSIs) will be used and competitors will be required to sail in accordance with the RYA Racing Charter. Competitors are reminded that they are responsible for ensuring their boat is in compliance with the Class Rules and spot checks will be carried out throughout the day. 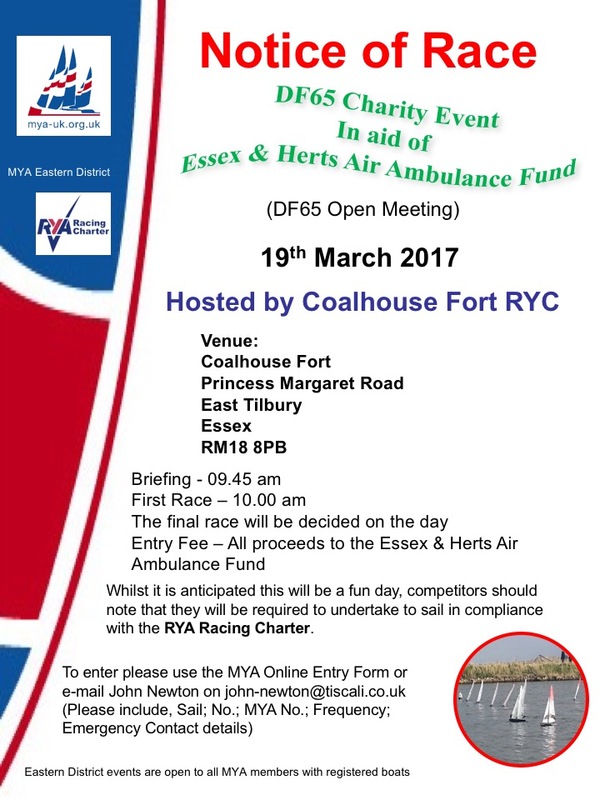 The Essex & Herts Air Ambulance Fund Charity Event, for Dragon Force 65 boats, hosted by Coalhouse Fort RYC on Sunday 19th March 2017 proved to be a challenge for those skippers participating. Being somewhat of a fun day, conventional racing was mixed with relay racing where skippers were paired based on their ability. In addition, a couple of ‘Round the Island’ clockwise and anti-clockwise races, were included, which involved sailing round ALL the outside marks at Coalhouse Fort. Whilst rain was threatened, it did not appear, whereas the forecast for relatively high winds which veered from SSW to WSW throughout the day did and created problems for Race Officer Geoff Appleton and skippers alike. The first four races were conventional races with a windward/leeward course at the southern end of the lake which Buzz Coleman, Glenn Meekcoms and Angela Mears handled better than most. In races 4 and 10 Buzz appeared to suffer a signal issue intermittently loosing contact between transmitter and boat. Buzz Coleman / Ian Kemp; Glenn Meekcoms / Lance Bennett; Angela Mears / Jamie Cornwell-Stevens; Malcolm Schaffer / Steve Bines; Dave Bland ‘ Jim La Roche; Dave Chamberlain / Howard Dalton. Those skippers who started first in the first race, went second in the second race, but it did not make much difference to Angela and Jamie won both races. Dave Chamberlain and Howard Dalton were second in the first race followed by Malcolm Schaffer and Steve Bines were third, whilst in the second race Buzz Coleman and Ian kemp were second followed by Malcolm Schaffer and Steve Bines in third again. Race 7 was the first of the ‘Round the Island Races’ with a few skippers getting caught out on the far side of the lake. It was won by Buzz Coleman with Dave Chamberlain second and Glenn Meekcoms third. Races 8 and 9 were then conventional races the first of which was won by Buzz Coleman followed by Dave Chamberlain with Glenn Meekcoms third, and Race 9 was won by Glenn Meekcoms followed by Buzz Coleman with Howard Dalton third. The final race of the day was the second of the ‘Round the Island’ races but this time anti-clockwise, which was won by Howard Dalton, followed by Jamie Cornwell-Stevens with Glenn Meekcoms third. At the end of the day, Buzz Coleman was declared the winner, followed by Glenn Meekcoms, with Angela Mears third. 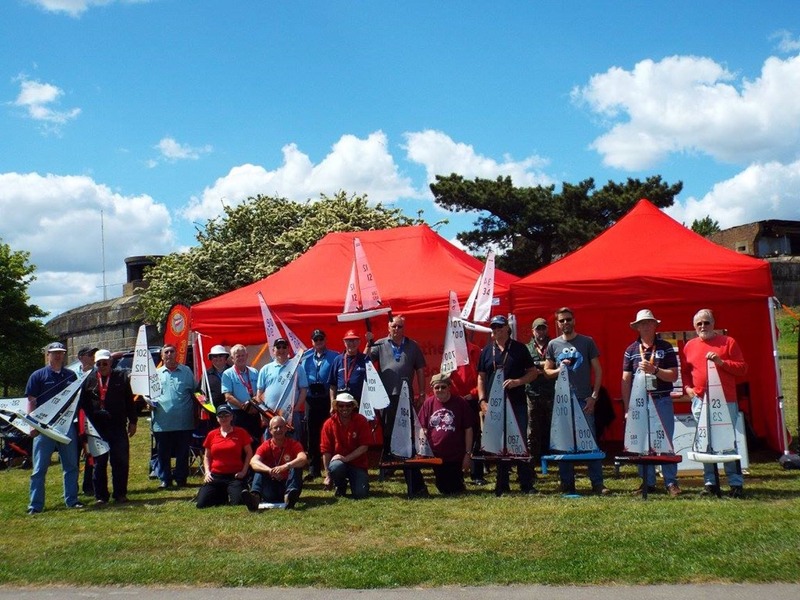 During the event a raffle was held using prizes supplied by CAT Sails (Transmitter Mitt) and Sochs Sails (Dragon Force 65 Transfers) and Coalhouse Fort RYC (Various Prizes) – our thanks to all those who contributed. The event itself raised £190.78 for the Essex & Herts Air Ambulance Fund and whilst less than what we have raised in previous years, we are extremely grateful to all those who contributed to the fund. Based on feed-back, whilst the day was a challenge it would appear that most if not all skippers enjoyed the day despite a few mishaps and we thank all those who enabled the event to go ahead. We plane to hold the event next year but possibly later in the year so watch this space for further news. Report Courtesy John Newton and Photos Dave Sellens. 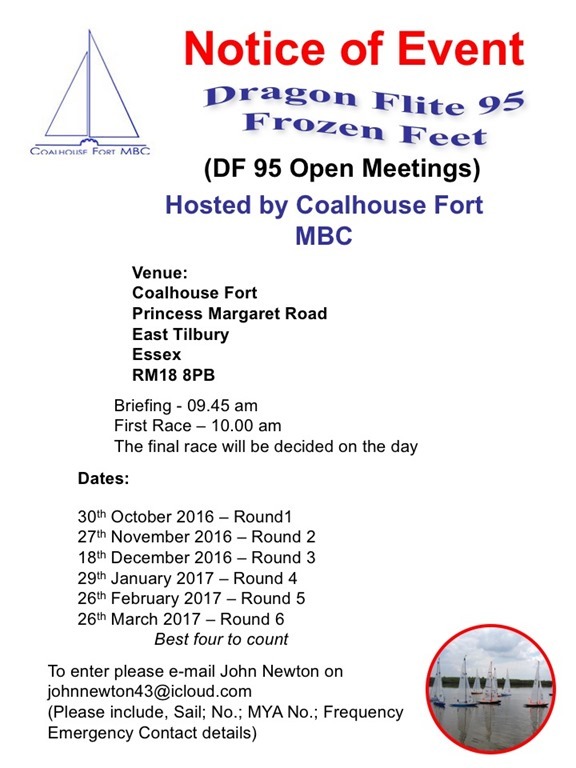 Coalhouse Fort RYC will be hosting a Dragon Force 65 Charity Event in aid of the Essex and Herts Air Ambulance Fund at their Coalhouse Fort, Princess Margaret Road, East Tilbury RM18 8PB, venue, on Sunday 19th March 2017. This event is open to all MYA members with a Dragon Force 65 boat, with all proceeds going to the Essex & Herts Air Ambulance Fund. There is no entry fee but skippers are requested to donate generously for this worthwhile cause. To enter, please use the MYA Online Entry Form or email john-newton@tiscali.co.uk, providing all your details including Name; MYA No; Sail No. and Emergency Contact information. There will be a skippers briefing at 09.45am with the event starting shortly after at 10.00am. This is a fun event and will potentially include relay racing and ‘Round the Island’ races with some prizes supplied by some Dragon Force 65 Suppliers, such as CAT Sails and Sochs Sails. 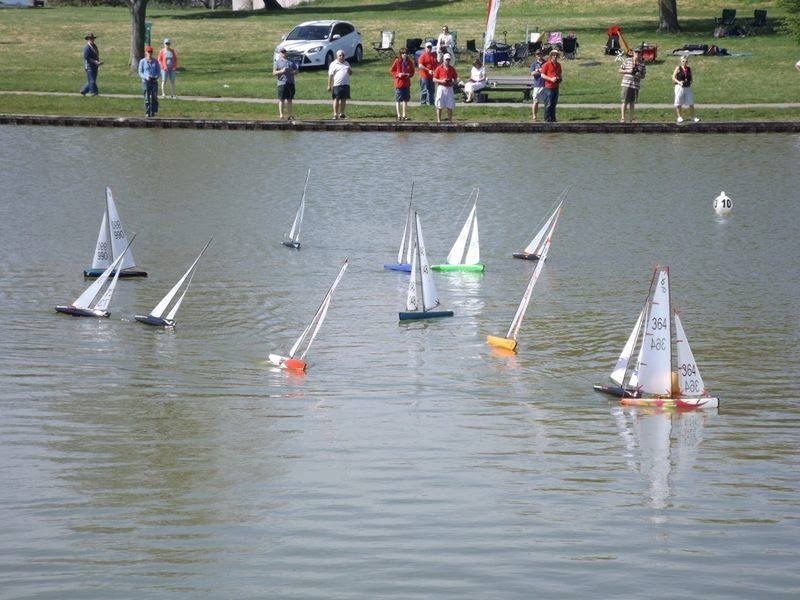 Please join us in welcoming Alton Radio Controlled Sailing Club as an MYA Affiliated Club into the Eastern District. The club currently has a membership of four and initially sail Dragon Force 65 boats, but is looking to expand, both in terms of membership and classes sailed. Members can sail at any time as the centre is open – 10 – 4pm 7 days a week. They have a permanent course set up for the prevailing winds and race every Saturday at 13:00 as things stand at the moment. If people are not already a member of the MYA then they will need to join the MYA as part of their membership of ARCSC. If people don’t want to join ARCSC then they can just turn up at the centre but they will need to pay a daily rate which is £12.50 a day. This rate is for all comers and there is no distinction made between model yacht users or any other craft. So it make sense to go through ARCSC. If you own a Dragon Force 65 Yacht, why not come along to Coalhouse Fort on Sunday 13th November and enter the ‘Frozen Fingers’ Winter Series for Dragon Force 65 Yachts. This is round 2 of 6 monthly events, with four rounds to count, so why not come and show us your sailing skills? We start racing shortly after 10.00am and finish by about 2.30pm with some comfort breaks in between. We would love to see you, so just turn up on the day and make your way round to the lake – free car parking and a cafe on site. You can find us at Coalhouse Fort, Princess Margaret Road, East Tilbury RM18 8PB. 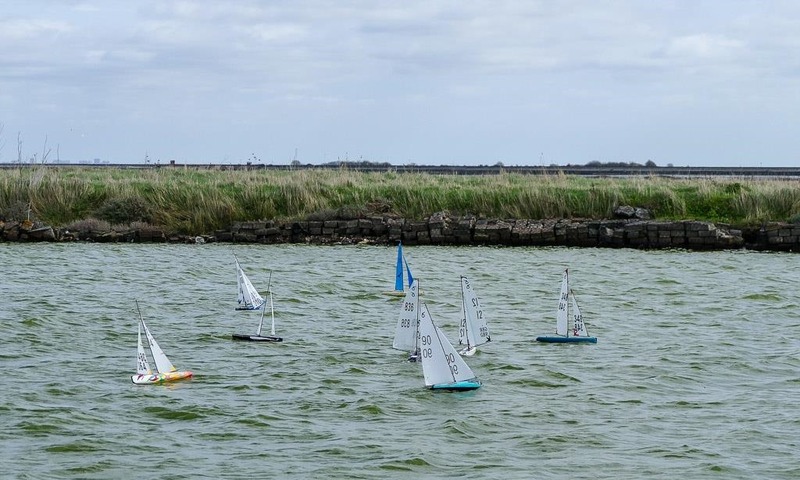 Coalhouse Fort MBC will be hosting two Winter Series Events, namely, ‘Frozen Fingers’ for Dragon Force 65 boats and ‘Frozen Feet’ for Dragon Flite 95 boats. Both series will consist of six monthly events, starting in October, with the best four to count – please see the ‘Notice of Race’ shown below for the dates of each series. 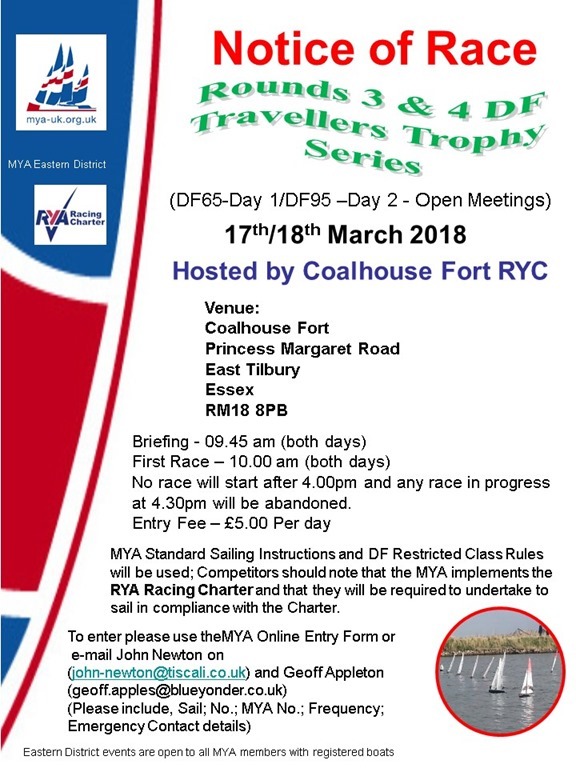 Both series are open to any skipper with a Dragon Force 65 or Dragon Flite 95 boat respectively and events will use the normal MYA SSI’s whilst skippers will be expected to sail in accordance with the RYA Racing Charter. Whilst skippers can enter on the day, It would be appreciated if they could advise their intention to participate in the events a few days before the respective dates. We look forward to welcoming all skippers, irrespective of experience or ability. What perfect weather for the Coalhouse Fort MBC Dragon Force 65 Charity Event in aid of the Essex & Herts Air Ambulance Fund on Sunday 8th May 2016. Apart from the wind coming initially from the ENE and then veering more to the east, the conditions were great for this Charity Event. 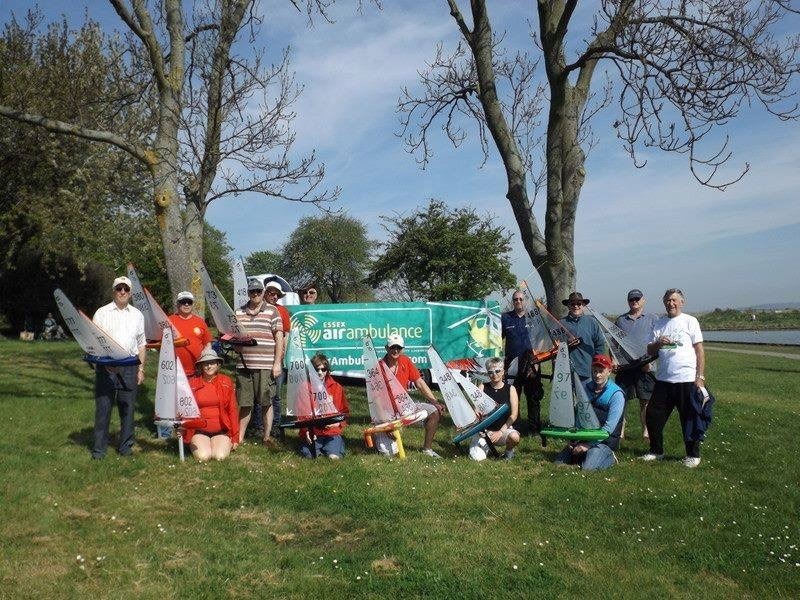 Skippers from Coalhouse Fort MBC and Southend MBC were joined by David Brown from Eastbourne and in a relaxed fun atmosphere, completed some 16 races to determine the overall winner. 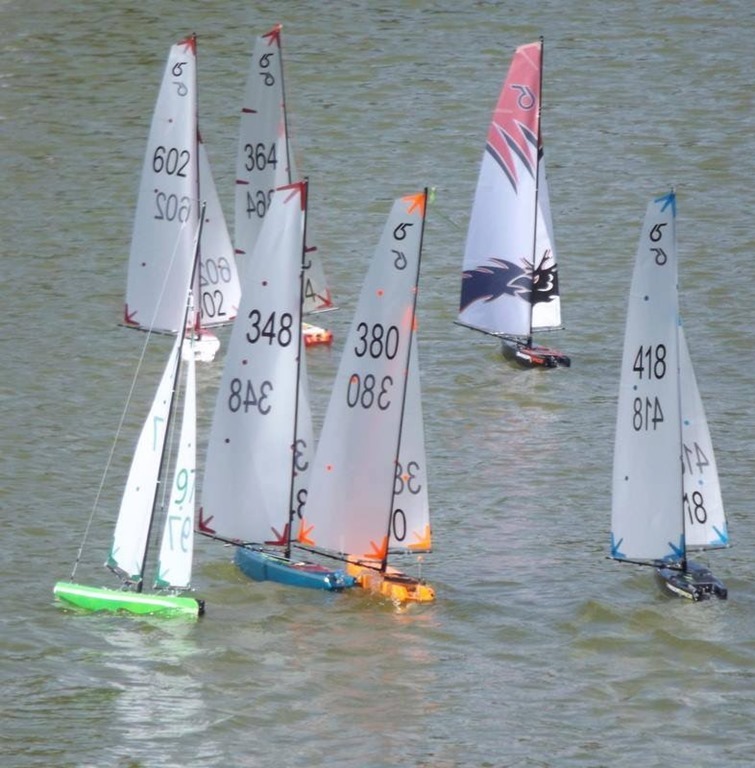 After the 16 races the fleet was split into two, an A & B Heat with the top three in each heat receiving prizes donated by Coalhouse Fort MBC and Sochs Sails. In addition to the winning prizes, there was a raffle with prizes being donated by RC Yachts, CAT sails, Sochs Sails and Howard Dalton, and our thanks to all for their donations. There was no entry fee, with all proceeds going to the Essex & Herts Air Ambulance Fund. With the wind initially coming from the ESE, John Newton the Race Officer, assisted by Malcolm Schaffer, set a windward/leeward course with a spreader mark at the windward end and a gate at the leeward end. Since most of the competitors had never experienced a ‘gate’ course before it was interesting to see how they coped. For the first three races, Howard Dalton led almost from start to finish with everybody following him round the port mark at the leeward end, with John Wren and David Brown keeping in touch. However, Glenn Meekcoms suddenly appeared to recognise that rounding the starboard mark at the gate provided some advantage and consequently took the next three races from Angela Mears, who had been leading until Glenn took a different course. As more people recognised the advantage to be gained of rounding the starboard mark at the gate, David Brown started to make his impression. By lunch time, David Brown was leading, with Howard Dalton second, Glenn Meekcoms third and Angela Mears fourth. After lunch the wind had veered more easterly and the Race Officer initially changed the start line and the first mark, but then went on to change the course two roundings of triangle all on port, thereby doing away with the gate. This seemed to cause some skippers more problems whilst others such as Angela Mears started to come into their own once they got used to the change. However, through the whole day David Brown was consistent which eventually led to him winning the overall event on 28 points, followed by Angela Mears on 33 points and Glenn Meekcoms third on 37 points. Unfortunately Howard Dalton who had been in the running had a rudder issue which meant he missed out on one race and suffered in at least two others because he had not centred the new servo properly. Following the main event, to ensure the less experienced skippers shared the spoils, the Race Officer split the fleet into two heats, the bottom half in terms of scores going into the ‘B’ Heat, and the top half going into the ‘A’ Heat and the top three from each heat winning a prize. The event raised £234.52 in total for the Essex & Herts Air Ambulance Fund, and our thanks to all those who contributed and especially to those who provided the prizes. It was a great day, with all the competitors behaving by doing turns when asked and at the end of the day indicating they had a good time. We hope to do it all again next year and hopefully a few more skippers will take part.